Another bisect, now at Sviķeniki! 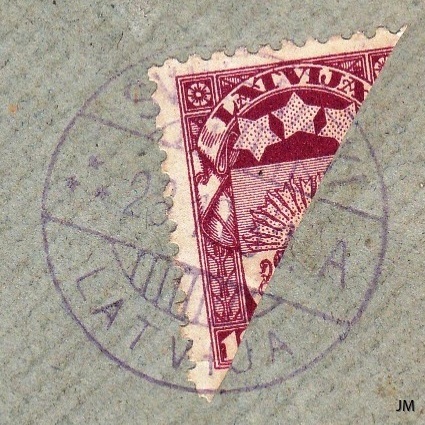 We have earlier seen about the Liepaja bisect, 10 kopek Courland liberation issue bisected and used at a post office in Liepaja as a result of shortage of 5 kopek stamps. Now I have in my hands a registered envelope locally sent (?) at Sviķenieki. 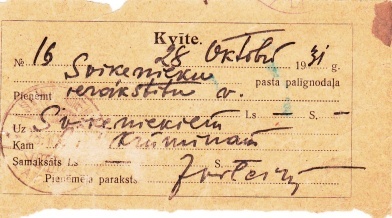 The postal branch at Sviķenieki (Babīte parish, 5 km northwest to Riga 7th post and telegraph office) was operating only from 01.08.1930 until 31.12.1931. The registered envelope is franked with a 15 santimi Coat of Arms stamp + a bisect 12 santimi Coat of Arms stamp and cancelled with a standard postmark SVIĶENIEKI 28.18.31. A. The franking is correct for a local registered letter - 6 sant. for a local letter + 15 sant. for the registration. The registration is confirmed by the “empty” red registration label - “R” with straight “leg” and hand-written “Sviķenieki” as well as the reg. number “16”. Furthermore, there is a receipt following the envelope having the reg. 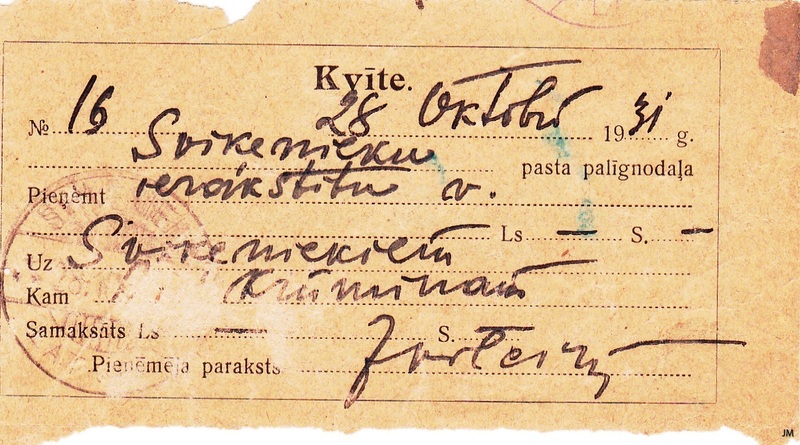 number “16” and dated 28 October 1931. 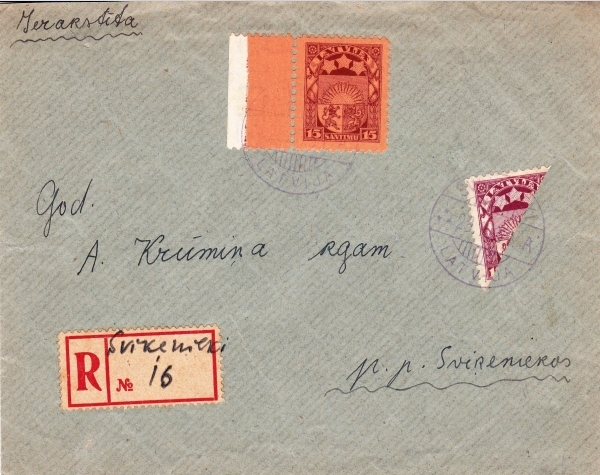 It also says that it is sent to Sviķenieki, Krūmiņam (the addressee – A. Krumiņa kgam) and signed by the postmaster at the postal branch - P. Vītoliņš. We can only speculate about the reason for the bisected stamp. Was there a shortage of 6 santimi stamps or was the postmaster foreseeing a philatelic rarity as the postal branch soon had to be closed? That’s obvious that Sviķenieki was a small postal branch and coming close to an end there could have been shortage of stamps. However, the common 6 santimi Coat of Arms stamps of 1927 were issued in a very great number (more than 24,5 million) so actually there shouldn’t have been a shortage of these at any post office. But who knows? And only two months to operate there perhaps were no reason to order for new ones. 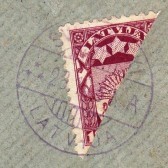 No other similar items of Sviķenieki is seen and this more points on a philatelic done letter to tempt some philatelist.